Retired teacher Mrs. Mary E. Swift’s rare and extensive doll collection was on display at the Capitol through the end of December. Mrs. Swift’s well-loved and cared for collection includes hundreds of black dolls from antique to modern, American-made and foreign, representing African Americans plus the black populations of Europe, the Americas and Africa itself. There are many rare and renowned dolls in this collection. “I started this collection because I wanted little black girls to feel good about themselves, to know that people around the world appreciate them and their culture,” said Mary Swift. Highlights of the display include a selection of vintage jointed composition dolls, a papier-mâché –headed doll dating to the mid-19th century, a selection of Byron Lars-designed collectable Barbies and a family of doll house-scaled figures made in the German Democratic Republic (East Germany). One display case is given over to black Kewpies; their creator, Rose O’Neill, created black versions of the Kewpies before 1920, including them and sympathetic portrayals of black children in her ladies’ magazine pages. Capitol Renovations, the fall exhibit, looked at various restoration and rehabilitation projects in the State Capitol building over the years. Seventy-five years ago, a group of forward-looking Arkansans revitalized the dying, inactive Arkansas State Fair. The Arkansas Livestock Show Association aimed to use the Fair to help Arkansans rethink farming, as well as to create an occasion of “city and country” coming together and passing a good time. Today’s Arkansas State Fair features the time-honored mix of livestock, crafts, food, noise, music and fun. The State Capitol salutes the Livestock Show Association’s 75-year tenure with its summer exhibit, See You at the Fair. Created in collaboration with the ALSA and drawing on the collections of the State Fair Museum, See You at the Fair tells the story of the present-day fair and its predecessors, events held in Hot Springs, Jonesboro and Little Rock’s Fair Park. In 1938, after several years in which no Fair was held, the Arkansas Livestock Show Association, led by El Dorado oilman T.H. Barton, revived the event to encourage Arkansas farmers to diversify with livestock, rather than continue to over- rely on staple crops. The intent was serious, but the fair would be fun as well: rodeos, competitions, amusements, “fair food” and celebrity appearances were featured. Made Here: From Arkansas, for the World highlighted a handful of roughly 3,000 Arkansas manufacturers whose products are made in Arkansas, destined for national and even global markets.The State Capitol’s Spring 2014 exhibit examined products manufactured in Arkansas with a look beyond the agriculture, commodities and natural resources that are familiar to most Arkansans. During the 1950s, state and local governments began to actively court manufacturers, touting Arkansas’s work force, a favorable tax and financial climate and a location with good access to both materials and markets. 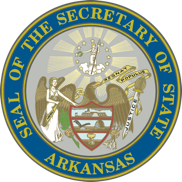 The Arkansas Industrial Development Commission, created in 1955, helped “sell” Arkansas to producers. Over time, many factories and assembly shops have closed,but others continue to open. Currently about 163,000 Arkansans work in manufacturing, and in 2012, their output was valued at nearly $16 billion. Made Here profiled the histories of six of Arkansas’s major manufacturers, including Daisy Outdoor Products, Baldor Electric, Remington Arms, American Railcar Industries, Ranger Boats and Alliance Rubber. Images and items supplied by these companies helped tell their stories and illustrated the output of their Arkansas operations. These include small arms ammunition and components from Remington and the prototype for Daisy’s 2015 Red Ryder 75th anniversary commemorative edition air gun. 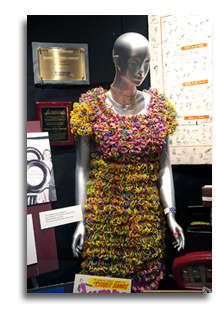 Alliance Rubber of Hot Springs supplied what may be the exhibit’s most eye-catching single item: a dress adorned with literally thousands of varicolored rubber bands. A pair of long-bill scissors commemorated one of Twentieth-century Arkansas’s pioneering manufacturers, Solid Steel Scissors of Fort Smith. Selected works from Arkansas Champion Trees: An Artist’s Journey were on display in the Lower-Level Gallery of the Arkansas StateCapitol in February 2014. 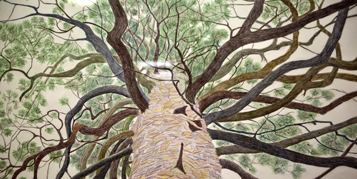 The statewide touring exhibit features the drawings and documentation of selected Arkansas champion trees by Hot Springs artistLinda Williams Palmer. The exhibit explores Arkansas’s natural and artistic heritage andinspires viewers to celebrate the beauty that can be found in their ownbackyards. The complete exhibit consists of 18 large colored pencildrawings, detail drawings, and photo-documentation of depicted trees;due to space constraints, the Capitol installation includes nine ofPalmer’s striking drawings. The artwork is accompanied by shortanecdotes and stories to encourage multi-generational conversations, andinformative text panels and a full-color brochure designed to inspirevisitors to learn more about Arkansas forests, history, art and science. The public can find exhibit information, educational materials and related links to forestry and natural resource programs at www.ChampionTreesExhibit.com. Arkansas Champion Trees: An Artist’s Journey was made possible through contributions by Champion Sponsors Plum Creek Timber Company, Domtar, and the Williams-Palmer Family; Medalist Sponsors Robyn and JohnHorn; and individual. This program is supported in part by the ArkansasArts Council, an agency of the Department of Arkansas Heritage, and bythe National Endowment for the Arts. The artist’s research and artwork are highlighted in a documentary produced by the Arkansas Educational Television Network. The program will premiere on February 20; Capitol visitors can view a preview version in the Capitol’s first-floor audiovisual area during the exhibit’s run. An educator’s guide and additional teacher resources are available to enrich the exhibit’s educational emphasis. Arkansas Champion Trees: An Artist’s Journey is organized for travel by the Arkansas State Committee of the National Museum of Women in the Arts. The Arkansas State Committee of the National Museum of Women in theArts is an advocacy organization for Arkansas women artists on the national level by organizing representation in the museum in Washington,D.C. In the state, the Committee advocates for Arkansas women artists on the state level by sponsoring juried exhibits, awarding scholarships and paid internships to artists and students, and providing an informative web site with an artists’ registry. Since 1991, theArkansas Committee has exhibited the work of over 500 Arkansas women artists in Washington, D.C., Germany, and throughout the state. For more information about the Arkansas Committee of the National Museum ofWomen in the Arts, visit acnmwa.org. The exhibit highlighted the 85 African-Americans who served in the Arkansas General Assembly during the last half of the nineteenth century. In 1868, Arkansas adopted a new constitution; its provisions included the right to vote and hold public office for black males. African American lawyers, merchants, ministers,educators, farmers, and other professionals served in the Arkansas General Assembly.Arkansas African American Legislators, 1868-1893, is a traveling exhibit produced by the Arkansas History Commission and Black History Commission of Arkansas. Previously displayed at the Arkansas State Capitol in 2012, the exhibit made a return visit in February 2014. 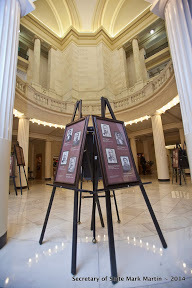 Including photographs of 46 of the 85 legislators, the exhibit also included a complete listing of the legislators and a short history of post-Civil War and election law“reforms” that effectively ended African Americans’ election to legislative positions until the 1970s.